Удобные, легкие, качественные, простые в использовании. Пользуюсь с удовольствием. 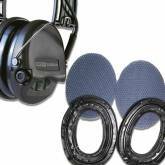 I am very pleesed wits service i got and with the quality of the ear protection. I love these, they respond fast enough to shoot and hear the case dropping to the floor. I also connect my shottimer to it so you don't bother other people while training drills. Have mine for over an year now and still running its first set of battery's. Good quality, nice product...does do everything I want...good protection! Works as I hoped. Happy with this hearingprotection. I never want to go back to normal ear protection. This gives a serious advantage to hear instructions at the range, whilst shots are fired. Outstanding stuff especially with the gel pads installed. Ho acquistato di recente questa cuffia per rimpiazzare quella (stessa identica marca/modello) che ho usato in questi ultimi 4 anni (della quale ero soddisfattissimo) ma questa volta sono rimasto molto deluso dalla qualita' del suono: e' decisamente scadente, molto peggio rispetto al modello "vecchio". Well, with the Sordin Supreme-Pro earmuffs you get the top of the art in ear protection. They are as light and comfortable that you will forget them (don\'t!). Nice to have (actually a Must), when you spend hours at the range / duty. Very high level quality product, looks cool and good. I also added the gel pads... this gives another 5 stars to this already awesome set. Very happy with this set. 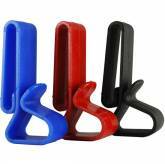 Outstanding quality and works great in combination with the gel pads over glasses. That gives a very tight seal without discomfort. Simply the best quality electronic ear defenders ever made! You only have to hold them in your hands, and try them on once, to know that you are holding the best electronic ear defenders on the market today! 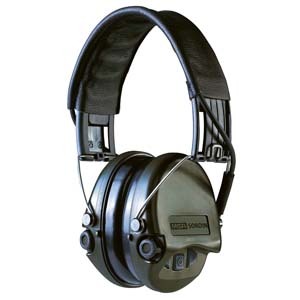 Both earmuffs are shaped to suit both right-handed and left-handed shooters (for comfortable rifle mounting). Two separate, well-shielded microphones for optimum stereo effect and location of sound direction. Rugged "military spec" construction: One piece molded cups, steel pins connecting the head band, glass fiber reinforced polymer head band and water proof one-piece switch rubber control pannel. High amplification and natural sound reproduction without chopping. Around 600 hours battery life with two standard AAA batteries. Power saving auto shut-off feature after 4 hours of no button input. AUX input for connecting external audio sources, such as an MP3 payer, hunting radios or dog tracker. Lead with 3.5 mm mono jack plug included. A comfortable, luxurious leather lining covers the head band. Available in OD-Green or Black.